with integrated farm sensing, analysis and predictions. Sensing+ provides visibility over your microclimate conditions – as they happen and 7 days ahead. Supported by our award-winning data science and Bosch-built hardware, Sensing+ collects, analyses and transforms raw data from your environment, before returning usable insights to your phone and PC. A fully installed and supported system,Sensing+ keeps you one step ahead of conditions that can impact your crops. From water to farm inputs, logistics to labour, Sensing+ provides the visibility you need to manage on-farm activities. By providing advance warning of what’s coming, Sensing+ also helps you mitigate risk and weather uncertainty by giving you time to prepare for incoming events. Custom notifications can also be set for when conditions reach or exceed a critical point, like those that can lead to a frost or disease outbreak. Your Sensing+™ farm sensors are deployed to different microclimates in your environment. A group of sensors in one location make up a node, which wirelessly communicates with a gateway on your farm. This gateway acts as a conduit, storing and securely passing information to our data platform, hosted on Microsoft Azure. You can expand your network at any time by simply adding extra nodes. Designed in collaboration with growers, the Sensing+ mobile app provides the insights that matter in an easy to read format. Complex data sets are shown as simple graphics, set on a dark background for outdoor visibility. 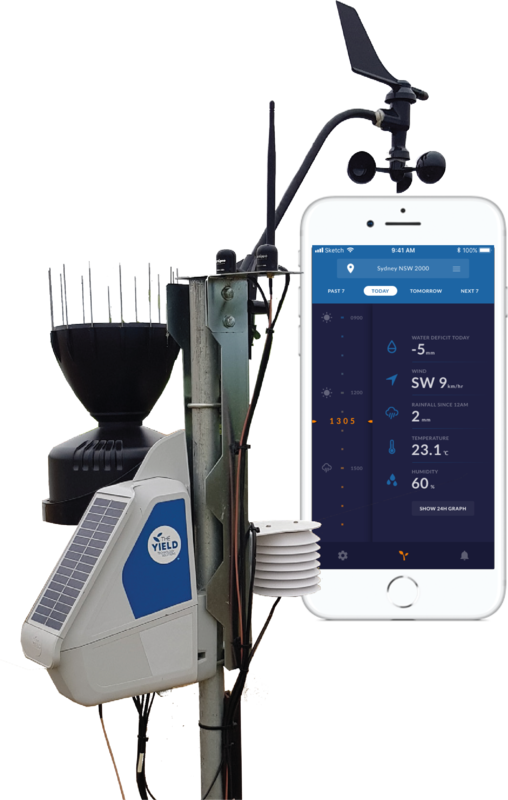 The Sensing+ web app has everything you need for desk-based work, including past, current and future conditions, and user management for your team, agronomist or contractors. Viewed in isolation, raw data is relatively meaningless. The real advantage comes from new information created when raw data is transformed. Sensing+ collects millions of pieces of data and applies AI techniques like machine learning to turn it into a usable asset. These models predict at sensor level, making them as hyper local as possible. They also learn and improve over time, so your predictions become even more accurate. Our sophisticated predictive models convert your on-farm data into 7-day predictions, allowing you to plan and make decisions with greater confidence. Top quality hardware is critical for on-farm sensing. Sensing+ nodes and supporting hardware is manufactured byBosch, one of the world’s most trusted names in engineering. The hardware has been put through its paces to stand up under the most rigorous outdoor conditions and comes fully installed and supported by The Yield. With the ability to review past conditions via historical reports, Sensing+ providing valuable insights for annual planning. With every season it records, Sensing+ historical reports will help you develop a better understanding of crop performance during certain events or conditions, and their eventual impact on yield. At The Yield, we maintain best practice data management standards that protect our customers. On-farm data is housed in the Microsoft cloud, which sets the global standard for enterprise security. It is encrypted from the moment it is collected from each sensor. Our farm sensors, soil probes & Bosch-manufactured hardware go where you need information—field by field, row by row, or in a hot spot. Your on-farm data is communicated to the cloud, where we use artificial intelligence and machine learning to analyse it, uncovering new insights into the way you grow. Get in touch and find out how Sensing + for Agriculture can help you make faster, more informed decisions on the farm. Copyright The Yield Pty Ltd 2017. All rights reserved.